Town Of Franklin major subdivision review process - subdivision involving the creation of 5 or more lots within any consecutive 10 year period. PROPOSED SUBDIVISION REGULATIONS - LOCAL LAW NUMBER 1 OF 2009. Major Subdivision Control Law - Local Law Number 1 of 2009. Please click here.Otherwise the entire Law is shown below. Please click here to read about the Rules of Conduct at Public Hearings. Effective date of both is September 30, 2009. Please click on the links below if you wish to drop down to a particular Article. Otherwise scroll on down. Pursuant to the authority granted to the Town in Articles 2 and 3 of the Municipal Home Rule Law the Town Board of the Town of Franklin authorizes and empowers the Planning Board of the Town of Franklin to approve or disapprove applications for major subdivision plat approval within the Town of Franklin. This law shall be known and cited as the Town of Franklin Major Subdivision Control Law. 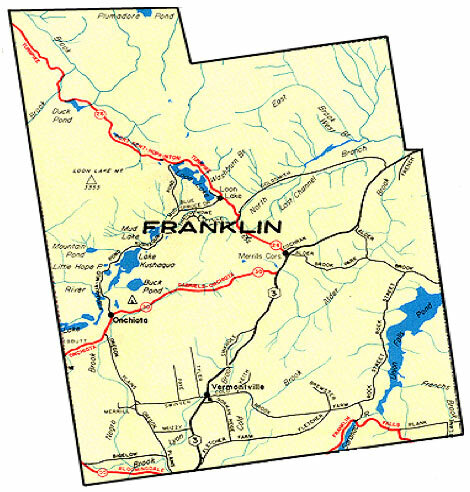 Prior to enactment of this law, there were no town regulations regarding subdivision control in the Town of Franklin. (f) Growth reflects the town's capacity and ability to provide infrastructure and services at a reasonable cost to all taxpayers. A. This law regulates all major subdivisions as defined herein. (3) Any building, utility installation, road construction or other new land use or development within the subdivision is undertaken. C.	All subdivision roads must be satisfactorily completed or financially guaranteed before any lot is sold. D.	Pursuant to Article 16 of the NYS Town Law, the Planning Board is hereby authorized to review and approve the development of plats which were filed in the Office of the Franklin County Clerk prior to the adoption of the "Town of Franklin Major Subdivision Control Law" and which are undeveloped, except those subject to approved permits by the Adirondack Park Agency and/or NYS Department of Health. "Undeveloped" means that 20 percent or more of the lots within the plat are unimproved. The procedure for approval of development of any such plat shall be the same as for a proposed new subdivision under this local law, as may be appropriately modified by the Planning Board. Whenever the requirements of this law are at variance with the requirements of any lawfully adopted rules, regulations, law or statutes, the most restrictive or those imposing the higher standard shall govern. No land use or development, disturbance or activity shall be undertaken or maintained except in conformity with all provisions contained in this law. Where this law is more restrictive than covenants or agreements between parties or other plan or other rules or regulations or the Adirondack Park Agency Act, the provisions of this law shall control. Nothing in this law shall be deemed to supersede, alter, enlarge or impair the jurisdiction of the Adirondack Park Agency pursuant to the state laws it administers. Application review and inspection fees shall be established by resolution of the Town Board. Except where specifically defined herein, all words used in this law shall carry their customary meaning. Adirondack Park Agency (APA). The NYS agency that administers the Adirondack Park Agency Act and Adirondack Park Land Use and Development Plan and provisions of the NYS Executive Law Article 27, regulating land use and development within the Adirondack Pack including the private lands within the Town of Franklin. In addition, the Adirondack Park Agency administers the Wild, Scenic and Recreational River System Act (Environmental Conservation Law, Article 15, Title 27) and the Freshwater Wetlands Act (Environmental Conservation Law, Article 24), which includes standards and permit jurisdiction to protect certain river and wetland resources. Referral of a new land and development to the Adirondack Park Agency is recommended for determination of jurisdiction and applicable requirements by laws administered by that agency. Access pull-off. Area for parking of vehicles adjacent to road rights of way on a lot in the subdivision and otherwise meets the standards for driveways. Applicant. A person (see separate definition) who is the current owner of record or authorized agent of the owner of record of land proposed for subdivision. Boundary line adjustment. The transfer of a parcel of land or real property between individuals, corporations or businesses consisting of less than the average lot size requirement of the overall intensity guidelines of the by in the Adirondack Park Land Use and Development Plan wherein the property is located, that results in the enlargement of one parcel and a reduction in size of another parcel. A boundary line adjustment can only occur between adjacent property owners. Code Enforcement Officer (CEO). Person appointed by the Town Board to assist in administering the Town of Franklin Major Subdivision Control Law. Community Sewage System. A system of piping, tanks, leach fields, or other facilities for the collection and treatment of sewage wastes serving more than one lot, whether owned by the Town, a private utility, or a homeowners association or similar organization. Community Water System. A source of potable water and necessary appurtenances together with a distribution system serving more than one lot, whether owned by the Town, a private utility, homeowners association or similar organization. Conservation Subdivision. Subdivision design process in which natural and cultural resources are first located and evaluated, then the development is located on the most suitable building area in a subdivision in order to protect and to maintain special natural resources and open space within the neighborhood. The intentions of conservation subdivision are to reduce infrastructure (roads, utilities, storm water); avoid impacts to and fragmentation of open space and sensitive natural resources; reduce building costs (avoid special engineering and construction methods); promote sustainable stewardship of open space for recreation, forestry, agriculture and protection of sensitive natural resource(s); and encourage buffers of new development to areas of concern. Final Plat. A drawing, in final form, prepared by a NYS licensed surveyor or engineer or architect, showing a proposed subdivision containing all information or detail required by law and by this law to be presented to the Planning Board for approval, and which after final plat approval, may be duly filed or recorded by the applicant in the Office of the County Clerk of Franklin County. Final Plat Approval. Signing of a final plat by a duly authorized officer of the Planning Board, after a resolution granting final approval to the plat, or after satisfaction of all conditions specified in a resolution granting conditional approval of the plat. Such final approval qualifies the plat for recording in the office of the County Clerk of Franklin County. Major Subdivision. Any division of a given tract of land into five (5) or more lots, parcels or sites over any consecutive ten (10) year period following the effective date of this law, or (b) any number of lots, parcels or sites which includes a new public road. Boundary line adjustments shall not be counted toward the 5-lot threshold. Mature Tree. Any tree in excess of six (6) inches in diameter at breast height. Minor Road. A road intended to be used as a private road providing access to residential properties or seasonal accommodations with an anticipated average traffic volume of less than 100 vehicles per day. Person. Any individual, corporation, partnership, association, trustee, municipality, or other legal entity, but shall not include the state or any state agency. Re-subdivision. A change (including lot line adjustment) in a subdivision plat filed in the Office of the County Clerk which (a) affects any areas reserved thereon for public or common use, (b) affects any street or road layout shown on such plat or (c) diminishes the size of any lot shown thereon. A merger or consolidation of adjoining lots that eliminates interior lot lines but does not change any approved building areas and lot lines does not constitute a subdivision. Shared Driveway. An arrangement whereby two to four lots is served by a common driveway. Sketch Plan. A scaled sketch of existing development, natural features and the concepts of a proposed subdivision and associated improvements as further described in Sections 415 and 505. Subdivision. Any division of land into two or more lots, parcels or sites, whether adjoining or not, for the purpose of sale, lease, license or any form of separate ownership or occupancy (including any grading, road construction, installation of utilities or other improvements or any other land use and development preparatory or incidental to any such division) by any person or by any other person controlled by, under common control with or controlling such person or by any group of persons acting in concert as part of a common scheme or plan. The term subdivision includes re-subdivision. Subdivision of land shall include any map, plat or other plan of the division of land, whether or not previously filed. Subdivision of land shall not include: the lease of land for hunting and fishing and other open space recreation uses; cemeteries; or mobile home parks whereby two to four mobile homes are sited on a single parcel of land; or boundary line adjustment as defined herein. Town Board. The Town Board of the Town of Franklin. Town Engineer. A licensed NYS professional engineer employed by the Town of Franklin. Zoning Law. At the time of enactment of this 2009 major subdivision control law, the Town of Franklin has no town Zoning Law. However, requirements of the Adirondack Park Land Use and Development, including over all intensity guidelines and shoreline restrictions regarding minimum lot size and shoreline lot width, minimum shoreline vegetation cutting restrictions, and minimum structure and sewage system horizontal setbacks from the mean high water mark of water bodies, apply to all private lands within the Town of Franklin as administered by the Adirondack Park Agency. Conservation subdivision principles are encouraged. Subdivision design shall preserve, insofar as is possible, all the natural features, terrain and drainage of the land and the ground and surface waters to be developed. Accordingly, proposed subdivisions that are to be located in areas characterized by steep slope, wet soils, shallow soils or other physical limitation for development or containing ground and surface water features shall be presumed to have significant resources. These may require special design features or mitigating measures if such resources are to be preserved and protected. In general, future uses upon land and water resources to be subdivided should be able to blend harmoniously with the surrounding topography, vegetation, and other natural features, and should avoid the need for costly land and shoreline alterations. A. Currently the Town of Franklin has no town zoning. However, the Adirondack Park Agency Act and State Wild, Scenic and Recreational River System Act includes minimum shoreline restrictions and over all intensity guidelines based on the private land use area classification, the Adirondack Park Agency should be consulted regarding applicable standards and restrictions. B. Lots to be Buildable. There shall be a buildable area on each proposed lot of sufficient size and suitably located for (a) a building and accessory structure(s), (b) an on-lot waste- water treatment system except where a community sewage system is proposed, (c) a well except where a community water system is proposed, (d) vehicle access, and (e) utilities. Such buildable area shall be free from such restrictions as wetlands, wet soils, ponded or wet areas, flood hazard, slope greater than twenty-five (25) percent, substantial rock outcrops, soil with bedrock close to the surface, and other conditions which would create difficulties for all related subdivision construction and for sewerage or waste water treatment. All on-site wastewater and water supply requirements must be consistent with New York State Department of Health or other applicable standards. C.	Access to Streets and Roads. Each lot shall have suitable access onto a public or private street or road by means of either: (1) an individual driveway or shared driveway in accordance with Section 340 hereof, or (2) a pull-off access outside of the right of way. D.	Driveway Locations. Each lot to have access by a driveway shall have a suitable location such that driveway slope at the intersection with the roadway does not exceed three (3) percent, driveway slope does not exceed fifteen (15) percent over any length, sight distance in each direction at the entrance to the roadway complies with the standards of Section 340 herein, and proposed driveway can provide for maintenance of existing drainage patterns. E.	Lot Shape. Elongated lots shall be avoided. The average depth of a lot shall generally not be greater than four (4) times its average width. F.	Side Lot Lines. Side lot lines shall generally be at right angles to the street or road except to follow natural features. G.	Corner Lots. Corner lots for residential use shall have adequate width to permit reasonable building setback from both roads so as to protect the neighborhood landscape. Features such as historic landmarks and buildings, existing trails, country lanes, rock outcrops, cliffs, forested ridges, scenic views and open space, hill top lookouts, rock gorges, unique stands of vegetation, significant wildlife habitats, and similar features of natural, or cultural value that provide a sense of uniqueness to the site shall be protected where practical. The Planning Board may require the provision of a green space buffer around such features. Shorelines of streams, lakes, and ponds shall be left in their natural state except for areas where vegetation is removed in compliance with minimum regulations of the Adirondack Park. Designating open space within a subdivision shall be encouraged to preserve the character of the town and to further the purposes of this law. Removal or damage to existing mature trees shall be minimized to the extent practical, except for dead, diseased or hazardous trees or minimal cutting needed for safety and drainage per sections 335, 345 and 355. Existing hedgerows, buffers along surface water courses, and vegetated topographic features that provide screening and buffers shall be protected. Where analysis shows that visual impact of the proposed development could negatively affect the neighborhood character, the Planning Board may require additional buffer or landscaping. Public roads: A subdivision road constructed, dedicated to the Town and accepted by the Town Board after final inspection, or the road is subject to financial security guaranteeing completion, before the first lot is sold. In the event the road is not accepted by that time, it remains a private road and will be owned and maintained in accordance with a plan approved by the Planning Board. a. A road conveyed to a homeowners' association that conforms to provisions of the NYS Department of Law pursuant to the terms of a recorded Declaration of Covenants and/or deeds. b. A road owned by the owners of lots in the subdivision pursuant to the terms of a recorded Declaration of Covenants and/or deeds. c.	A road maintained in accordance with the terms of a road maintenance agreement which provides for sharing the obligations and costs of repair and maintenance. This agreement shall be executed by the owners of all lots and properties to which access is obtained by use of said road. The agreement shall run with the land and be binding on the owners, their successors, distributees and assigns and shall be recorded in the Office of the Franklin County Clerk simultaneously with the filing of the approved subdivision plat. d.	A road owned and maintained by some other form of legally binding recorded agreement which addresses on-going maintenance responsibilities of future lot owners. e.	The intent of this law is to guarantee that there is a workable, mandatory private maintenance cost-sharing arrangement in place, and that the road is either satisfactorily completed or financially guaranteed, before the first lot is sold. B. When any road is to be dedicated to the Town, the subdivision application must address the contingency of the Town's Board refusal to accept the road and the Planning Board must address that contingency in its decision. The applicant is responsible for maintenance of all subdivision roads until conveyance to the Town or another entity. A. All standards in this section are minimum requirements. The Planning Board may require additional design standards, or vary these standards, in any particular case based upon the recommendation of the Town Highway Superintendent in consultation with the County Engineer or Town Engineer. (1) To be determined by the Planning Board at the time of subdivision review and approval. Roads intended to become town highways shall be paved with at least a 12 inch compacted gravel base with at least 2 inches of regular binder and topped with 1 inch State Top Hot Asphalt (see section 325). (2) At all points along a road, there shall be an unobstructed line of sight in each direction for the minimum distance specified. (3) Adequate provisions for storm water, snow plowing and public utilities (see section 345). B. Relation to Terrain. The layout of any roads shall be coordinated into a logical and efficient system where the existing topography, soils, vegetation, and other natural features are protected to the best extent possible. Areas with steep slopes, shallow soils, soils with a water table at or near the surface, and soils that are highly susceptible to erosion or slippage shall be avoided insofar as practical. Roads shall be designed to be parallel to natural land contours where possible. Long stretches of road straight downhill should be avoided in order to minimize erosion problems, and for safety reasons. Road layout shall minimize stream crossings and shall avoid traversing slopes exceeding 12%. C.	Intersections. Roads shall intersect one another at right angles with adequate sight distances. No proposed intersection with an existing road shall be less than 125 feet from any existing intersection unless the proposed intersection is directly opposite the existing intersection so as to create a four-way intersection. D.	Dead End Roads. Dead-end major roads shall be provided at the closed end with a circular turn-around having an outside roadway radius of at least 100 feet. Dead-end minor roads shall be provided with such circular turn-around, or a tee type turn-around of dimensions deemed sufficient for snow plowing and emergency vehicles. E.	Access to adjoining property. In order to make possible the extension of roads or utilities into neighboring properties, the arrangement of roads in a subdivision shall provide for connection to adjoining lands which may be subdivided in the future. F.	Names and Numbers. Names of new roads shall not duplicate existing or platted roads and shall conform to Franklin County 911 system. New roads which are extended or in alignment with existing roads shall bear the name of the existing roads. G.	Road Signs. The applicant shall provide and erect road signs and posts of a type to be approved by the Planning Board at all road intersections prior to acceptance of the constructed roads. H.	Utilities. Installations of utility distribution and service lines shall be planned at the time road layout is determined and their installation coordinated with the road construction. A. A. All standards in this section are minimum requirements. The Planning Board may require additional construction standards in any particular case based upon the recommendation of the Town Highway Superintendent in consultation with the County Engineer or Town Engineer. The Planning Board may waive or vary the requirements of this section upon the recommendation of the Town Highway Superintendent in consultation with the County or Town Engineer. B. The road bed shall consist of removal of unsuitable organic material, topsoil and large stones and boulders, at least twelve (12) inches of quality grade gravel, compacted, and at least 4 inches of Item 4 or equal on top for the entire width of the road bed. C.	All areas to be filled for road construction shall be cleared and grubbed prior to placement of suitable fill. Clearing and grubbing shall consist of removal of all woody vegetation including trees, fallen trees, logs, stumps, roots, brush, and large stones and boulders. Roads intended to become town highways shall be inspected by the Town Highway Superintendent prior to placement of road base material. All fills shall be compacted to provide stability of material and to prevent undue settling. D.	Roads intended to become town highways shall be paved with at least 2 inches of regular binder and topped with 1 inch State Top Hot Asphalt. E.	All necessary drainage facilities to manage storm water runoff created by any new street or road or by redevelopment within the subdivision including grading, whether located within the street or road right-of-way or elsewhere, shall be installed prior to take over and/or final plat approval (see Section 470). All culverts shall be of the necessary length and diameter with appropriate aprons and shall be approved by the Highway Superintendent in consultation with the County or Town Engineer. F.	All necessary drainage shall be dug and all rocks and stumps shall be removed from drainage ditches. The minimum depth of the ditches shall be eighteen (18) inches. G.	In the event that sloping needs to be done in the area of a steep bank or embankment this shall be done at a maximum grade of 2 to 1 (2 units vertical distance for each 1 unit horizontal distance). H.	Until transfer to appropriate entity, all improvements and maintenance shall be made at the expense of the applicant. The Planning Board may require that one or more 50 foot rights-of-way be reserved, in suitable locations to meet the road standards hereof, to provide for future road access to interior land. Said distances shall be measured from the point of entry onto the public road. B. If the location of one or more proposed driveways is such that a traffic hazard is created on an existing roadway due to inadequate sight distance, the Planning Board may require an alternative lot arrangement making use of a shared driveway or short access road which enters the existing roadway at a safer location. C.	This section is intended to insure that the best location for a driveway or entrance to a roadway is chosen given the unique circumstances of the lot to be subdivided. It is not intended to prevent the subdivision of a lot, but to minimize any possible hazard. D.	The Planning Board or the Town Highway Superintendent may require installation of road safety signage and street lighting at intersection(s) of town approved structures. The lighting hoods shall direct the light downward and shall be designed to protect night skies and avoid glare. A. Sufficient legal arrangement, such as a right-of-way easement, shall be made to provide for the future use and maintenance of shared driveways. B. Shared driveways shall be constructed so as to be passable by emergency vehicles during all seasons of the year. C.	The right-of-way easement for any shared driveway without utilities shall be at least twenty-five (25) feet wide. D.	Minimum width of the driving surface shall be 12 feet. E.	Maximum grade shall be twelve (12) percent. F.	No shared driveway shall serve more than four (4) lots. G.	A shared driveway shall only serve lots occupied by a one or two family dwellings and no commercial, industrial or other uses which generate significant traffic. H.	Access pull-offs shall be located adjacent to road right of way. A.	Off-site storm water runoff shall not create damage or difficulty to down slope properties, shall not overload down slope culverts and other drainage facilities, and shall not introduce pollutants to surface waters of the Town of Franklin. Features of the natural terrain shall be used to the extent practical to reduce runoff from the site. Retention basins, dry wells and other infiltration structural devices to reduce runoff from the site may be required by the Planning Board. Consideration shall be given to storage of and runoff by snow from winter plowing. B. All major subdivisions as defined herein, and any subdivision that involves one acre or more of land disturbance, shall comply with applicable Storm water Phase II Permit and State Pollution Discharge Permit requirements of the New York State Department of Environmental Conservation, including the preparation of a Storm Water Pollution Prevention Plan (SWPPP), and the construction and/or implementation of all drainage control measures prescribed by such SWPPP. C.	Ditch bottoms shall be constructed and maintained to prevent soil erosion by means of sodding, mulching, netting, stone paving, rip-rap, or other appropriate materials. D.	All cleared areas associated with the construction of roads and installation of utilities, excluding those areas comprising road surfaces or shoulders, all exposed borrow areas, and all cut and fill slopes including ditch banks, shall be successfully vegetated to native, non-invasive grasses or legumes that are suited to site conditions within the same growing season of the final grade, or temporary erosion control measures shall be installed and maintained until permanently stabilized. E.	Areas on which vegetation has been destroyed or removed, excluding roadways, driveways, building sites and parking lots, shall be successfully re-vegetated or otherwise stabilized with structural erosion control measures. F.	Upon completion of final grading of any area, mulching and re-vegetation operations shall begin within five (5) working days and shall be completed within ten (10) working days, provided however that where this is not possible or desirable because of weather conditions or other circumstances, such re-vegetation operations shall be performed as soon as reasonably possible. G.	Re-vegetation and temporary erosion control measures shall be evaluated for compliance between 180 and 360 calendar days from the date of planting, and following any significant storm events. Corrective action shall be instituted and completed within fifteen (15) working days upon determination of unsatisfactory compliance. In making their determination the Planning Board, Highway Superintendent, Code Enforcement Officer or designee thereof shall consider rills, gullies, loss of mulch, loss of seed, or failure of seed germination as evidence of unsatisfactory compliance. A. Where appropriate, the Planning Board will encourage recreation trails and designated open space within the subdivision, either as trails or protected undeveloped areas wholly within the land to be subdivided or connected to existing or possible future trails or open space. B. The Planning Board may recommend that a portion of the total land area of the subdivision be designated for such trails and open space (see section 310). Clearing and grading for road and utility installations shall be limited to that which is necessary to construct safe roads, provide needed roadside and embankment drainage, construct stable cuts and fills and provide for utility installation. Also see section 315. Development activities shall be located on existing slopes less than 25 percent, and preferably on slopes less than 15 percent, measured over any 100 foot horizontal distance. If at any time before or during construction of improvements it is demonstrated that unforeseen conditions make it necessary to modify the location or design of improvements, a designated Planning Board member, in consultation with an engineer where appropriate, may authorize such modifications, provided these modifications are within the spirit and intent of the Planning Board's approval and do not amount to a waiver or substantial alteration of any improvements required by the Planning Board. The designated Planning Board member shall issue any authorization under this paragraph in writing, and shall submit a copy of such authorization to the Planning Board at their next meeting. If such authorization should result in a modified final plat, the revised final plat shall be filed with the County Clerk. A. Employ noise abatement design for loud noise sources (generators etc.) and natural buffers such as vegetation and topography to minimize disturbance to adjacent properties. B. Preserve and enhance the character, scenic qualities and open space of the property and its neighborhood by using siting methods to avoid or minimize adverse visual impacts. C.	Consider compatibility of new development with the character of adjoining and nearby land uses. D.	Maintain and enhance the existing physical, biological and aesthetic characteristics of ground and surface waters and the shoreline of lakes, ponds, rivers and streams. Avoid development in areas that have flooded or have the potential to flood. Provide protections for wetlands and rivers and consult APA regarding its wetland regulations and rivers subject to the NYS Wild, Scenic and Recreational River System Act. E.	Promote sustainable management of forest, wildlife and other resources. F.	Recognize the properties of soils, and plan development including waste water disposal systems to avoid problem characteristics that would require special design and construction, maintain existing productive agricultural and forestry lands, and prevent contamination of ground water and erosion. Minimize topographic alterations. G.	Design, site, construct and maintain buildings to best serve their intended functions and to avoid or minimize impact on the existing natural and public resources. H.	Design, locate, construct and maintain storm drainage systems so as to maintain existing drainage patterns and to avoid or minimize adverse hydrologic effects. I. When appropriate, encourage a range of affordable housing opportunities. J. Promote renewable energy and green building principles. K.	No proposed structure or land use shall be designed, constructed or operated in any manner to create dangerous, injurious or noxious conditions that would adversely impact reasonable use of nearby properties. Noxious conditions could include noise, vibration, light glare, odor, dust, smoke, atmospheric pollutants, hazardous materials, trash/garbage or manure. (2) the development is in keeping with the spirit and intent of this law. B. The Planning Board shall record the reasons for any such waiver in its minutes. A. Design and review process. The intentions of the review processes are to develop an approvable subdivision plan in a cost and time effective manner, taking into consideration multiple factors, and providing for fair opportunity for public review and consistent application of the process and standards and guidelines herein. It is the intent to generate good information to guide development of a subdivision plan based on a collaborative and consensual, instead of adversarial and combative process. B.	SEQR. The Planning Board shall comply with the provisions of the State Environmental Quality Review Act ("SEQR") under Article 8 of the New York Environmental Conservation Law and its implementing regulations. Time periods set forth below shall be modified to coordinate with SEQR review as provided in New York State Town Law Section 276. C.	Gift, Devise, or Inheritance. In the case of a subdivision of land resulting from a bona fide gift, devise or inheritance by and from natural persons which constitutes a major subdivision, the Planning Board may, in its sole discretion, waive the required fee. However, such a division of land shall remain subject to all other provisions of this law. 1. Sketch plan conference and on-site reviews. 2. Application for preliminary plat approval. 3. Determination of SEQR applicability. 4. Public hearing on preliminary plat. 5. Planning Board action on preliminary plat. 6. Application for final plat approval. 7. Public hearing on final plat (Not required for all approvals. (See Section 440). 8. Planning Board action on final plat. 4.	special information beyond the minimum listed in section 500 and section 510(sketch plan) to be required on the application for preliminary plat subdivision approval. This important first step does not require a formal application fee. The applicant shall provide eight (8) copies of all maps for each stage of review to facilitate review (one copy for each Planning Board member, one for the Code Enforcement Officer, one for the Town Clerk and subdivision file, and one for public review). (3) Current names and addresses of adjacent property owners to the proposed property to be subdivided. D. The Planning Board shall conduct at least one on-site tour of the property during the Sketch Plan stage of review, and may, at the Planning Board's discretion, schedule additional tour(s) during the Sketch Plan and later stages of review, each tour shall be noticed in conformance with the Open Meetings Law, and a notice of each said tour shall also be first class mailed to the applicant and adjacent property owners at least one week in advance of the tour, which notices shall also invite written comment by a date certain. Individual Planning Board members and/or Code Enforcement Officer may also inspect the property at any other time, with reasonable notice only to the applicant, provided a quorum of the Planning Board is not present on the property at the same time. Adjacent property owners and members of the public shall not be authorized to enter on to an applicant's property except during duly-noticed Planning Board tours. A. Form. Applications shall be on a form provided by the code enforcement officer or Town Clerk, and shall include the elements described in Article 5 herein. Eight (8) copies of the application and eight (8) copies of the preliminary plat maps shall be provided. All applications for preliminary Plat approval shall be accompanied by the application fee. B. Applicant to Attend Planning Board Meeting. The applicant, or his duly authorized representative, shall attend any meeting of the Planning Board to discuss the proposed Major Subdivision Preliminary Plat. C.	SEQR. An application shall not be deemed to be complete until all the requirements the applicant is responsible to provide for the State Environmental Quality Review Act (SEQR) are fulfilled, which may include: (1) the preparation of a short Environmental Assessment Form and making a determination of non-significance on said form, (2) the preparation of a Full Environmental Assessment Form and the filing of a negative declaration of significance or a conditional negative declaration of significance, (3) the preparation of a Full Environmental Assessment Form, the filing a positive declaration of significance, and the completion and filing of a Draft Environmental Impact Statement, or (4) a written determination by the APA, that it has permit review over the entire subdivision, hence an exempt or type "2" action under SEQR. Under the first three scenarios above, the planning board must establish lead agency, determine impact significance and file declarations as required by SEQR. D. Date of Official Submission and fees. The date of submission of the shall be considered to be the date on which a completed application for preliminary plat approval, SEQR documents, and the required fee have been filed with the Town Clerk or Town Code Enforcement Officer. Within sixty-two (62) days of receipt of a complete application for approval of a Preliminary Plat for a Major Subdivision, the Planning Board shall conduct a public hearing. The hearing shall be advertised at least once in a newspaper of general circulation in the Town at least ten (10) days before the hearing. The written notice shall also be provided by first class mail to all adjoining property owners based on the latest available tax map information and to any involved town, county or state agency also having jurisdiction or seeking their advise and comment. If the subdivision is reviewable by the APA, notice of the hearing shall be provided to the Adirondack Park Agency at least ten (10) days prior to such hearing. Coordinated review shall be encouraged with involved state agencies such as APA, DEC, DOH, DOL or DOT. If required by Section 239-n of the General Municipal Law, the applicant shall also be referred to the county or regional planning agency having jurisdiction, for said agency's comment. A. Within sixty-two (62) days from the public hearing for a Preliminary Plat for a Major Subdivision the Planning Board shall render a decision on the application. The Planning Board shall approve, approve with modifications, or disapprove the plat, and state any modifications or reasons for disapproval in the form of a written resolution. The time in which the Planning Board must take action on such plat may be extended by mutual consent of the applicant and the Planning Board. Failure of the Planning Board to act within such sixty-two (62) day or otherwise agreed upon period shall be deemed approval of the Major Subdivision Preliminary Plat. Within five (5) business days of approval, the plat shall be certified by the Clerk of the Planning Board as having been granted approval. One copy shall be returned by mail to the applicant, and one copy shall be retained by the Planning Board. B. When granting approval to a Major Subdivision Preliminary Plat, the Planning Board shall state the terms of such approval, if any, with respect to any modifications, waivers, required infrastructure and/or financial security. With any determination of disapproval, the Board shall state in writing the reasons for failure to comply with the standards and guidelines of this law and/or SEQR, providing a copy to the applicant and the town clerk. C.	Approval of a preliminary plat shall not constitute approval of the final plat. The preliminary plat and any terms of approval shall be a guide to the preparation of the final plat. A. Application and Fee. Unless otherwise agreed by the Planning Board and the applicant, the applicant shall submit an application for Major Subdivision Final Plat approval within six months after Major Subdivision Preliminary Plat approval. Failure to do so within such time period may require resubmission of the Major Subdivision Preliminary Plat to the Planning Board. The application shall be on a form provided by the Town Clerk or the code enforcement officer, and shall include the elements described in Article 5 herein. The Major Subdivision Final Plat shall conform to all the terms of the approved Major Subdivision Preliminary Plat. All applications for Major Subdivision Final Plat approval shall be accompanied by the application fee. B. Number of Copies. Eight (8) copies of the application and eight (8) copies of the maps for Major Subdivision Final Plat approval shall be presented to the Town Clerk or Code Enforcement Officer at the time of submission of the Major Subdivision Final Plat. C.	Information Regarding Other Agency's Review. The applicant shall provide copies of the applicant's complete applications to, any additional information requests from, or approvals of, other agencies having jurisdiction over the project, such as proposed water supply, wastewater treatment, or storm water control facilities or other appropriate approvals associated with the subdivision requiring approval by the APA, Department of Environmental Conservation and/or the State or County Department of Health. D.	Date of Official Submission and Referral to County or Regional Planning Agency Where Necessary. The date of submission of the Major Subdivision Final Plat shall be considered to be the date on which a completed application for approval of the Major Subdivision Final Plat, including any information required by paragraph C of this section, and the required fee have been filed with the Town Clerk or code enforcement officer. The final plat public hearing may, within the Planning Board discretion, be waived for subdivisions that have received preliminary plat approval without significant modifications, and that are in substantial agreement with the approved preliminary plat. For other applications, the Planning Board shall conduct a public hearing within sixty-two (62) days of receipt of a complete application for final plat approval. The hearing shall be advertised at least once in a newspaper of general circulation in the Town at least ten (10) days before the hearing. The written notice shall also be provided by first class mail to all adjoining property owners based on the latest available tax map information and to any involved town, county or state agency also having jurisdiction or seeking their advise and comment. If the subdivision is reviewable by the APA, notice of the hearing shall be provided to the Adirondack Park Agency at least ten (10) days prior to such hearing. A. A. Within sixty-two (62) days of the date of official submission of a Subdivision Plat if no hearing is held, or in the event a hearing is held, not more than sixty-two (62) days after the completion of such hearing, the Planning Board shall by resolution conditionally approve, disapprove, or grant final approval, and authorize the signing of such plat. This time period may be extended by written agreement of the applicant and the Planning Board. Failure to take action on a final plat within such sixty-two (62) day or otherwise agreed upon period shall be deemed final approval of the plat and a certificate of the Town Clerk as to the date of submission and the failure to take action shall be issued on demand. Signing and filing of the final subdivision plat shall not be granted until the requirements of Sections 455 and 460 or Article 6 hereof to the extent applicable. B. A copy of the resolution stating the decision of the Planning Board shall be filed with the office of the Town Clerk and applicant. Upon conditional approval, with or without modification, of a final plat, the Planning Board shall empower a duly authorized Planning Board member and code enforcement officer to sign the plat and grant final plat approval when all requirements stated in the conditional approval resolution have been satisfied. The plat shall be certified by the Town Clerk or code enforcement officer of the Planning Board as conditionally approved, a copy shall be filed in the town office, and a certified copy mailed to the applicant. A certified statement of the conditions shall accompany the plat which, when completed, will authorize the signing of the conditionally approved final plat. The conditionally approved plat shall expire one year after the date of the resolution granting conditional approval. The Planning Board may, however, extend the expiration time not to exceed two additional periods of 180 days each. Upon completion of the requirements, the final plat shall be filed with Town Clerk. Conditional approval does not qualify a final plat for recording nor authorize issuance of building permits prior to final plat approval. (b) in lieu of the completion of improvements prior to final plat approval, financial guarantee is provided by the applicant in accordance with Article 6 herein. The applicant shall record the signed Final Plat, or section thereof, as hereafter provided, in the Office of the Clerk of Franklin County, Malone, New York within sixty-two (62) days after the date of approval, otherwise the approval shall expire. A. Prior to granting final plat approval, the Planning Board may permit the plat to be phased into two or more sections and may impose such conditions upon the filing of the sections as it may deem necessary to assure the orderly development of the plat. Approval to the sections, subject to any conditions imposed by the board, shall be granted concurrently with approval of the plat. B. In the event the owner shall file only a section of such approved plat in the office of the county clerk within the sixty-two (62) day period specified in part A above, such section shall encompass at least ten percent of the total number of lots contained in the approved plat and the approval of the remaining sections of the approved plat shall expire unless said sections are filed before the expiration of the exemption period to which such plat is entitled under the provisions of Section 265-a of the Town Law. Final Plat approval by the Planning Board shall not be deemed an acceptance by the Town of any road, improvements or other land shown dedicated by the applicant. Costs incurred by the Town Planning Board for professional consultation fees or other extraordinary expenses in connection with the review of a proposed major subdivision shall be charged to the applicant as provided for by SEQR. Prior to incurring such costs, the Planning Board shall discuss such costs with the applicant. Where the APA has jurisdiction, concurrent and coordinated review is strongly encouraged to help reduce the need for professional review costs to the applicant. 1. The location of that portion of the applicant's ownership which is to be subdivided in relation to their whole property, and the location of nearby streets and roads, utilities and nearby improvements on adjacent properties. 2. The name of the owner(s) of the property to be owner(s) and current names of adjacent property owners as disclosed by the most recent municipal tax records. 4. All existing buildings or structures, roads, trails, rights of way, utilities, and other improvements on the site, all easements and encumbrances and identification of current use. 1. Flood hazard areas as shown on the Federal Insurance Administration (FEMA) Flood Hazard Boundary Map or Flood Hazard Rate Map, or other areas with a history of flooding. 5. USDA NRCS Detailed Soil Map, when available, with severe rated soil characteristics for development. 5. Scenic views from and into the property from public roads and trails and within 200 feet on adjacent properties. 3.	proposed recreation, open space or protected areas. F.	All utilities, streets, rights of ways, and trails, existing and proposed. G.	The buildable areas and access routes can be temporarily staked or flagged in the field to help facilitate the two on-site reviews. H.	Scaled overlay of proposed conceptual building areas, subdivision layout including access. I. All existing restrictions on the use of land including easements or covenants. Name and address of applicant and their professional consultants, including NYS license numbers and seals. 2. The scale of all maps shall be one inch = one hundred feet (1 inch = 100 feet) unless specified otherwise by the Planning Board. 4. Adjacent properties and names of current owners. 5. Total acreage of subdivision and number of lots proposed. 6. Existing restrictions on the use of land including easements, covenants and zoning. 7. Water courses and their watershed boundaries/drainage patterns, APA defined wetlands, wooded and field areas, public facilities and other significant biological, natural or physical features on or near the site. 8. Existing land contours (10 foot intervals overall, with 2 foot intervals in proposed development areas) in the areas of proposed building envelopes (suitable area for structures, driveways access, all utilities and associated lot improvements) and proposed subdivision improvements (roads, utilities, storm drainage etc). 9. Proposed lot lines with approximate dimensions, area of each lot, and designated suitable building envelope (area for all improvements to support the use on the lot). 10. The width and location of any roads or pubic ways including trails and the width, location, grades and road profiles of all roads or public ways proposed by the developer. 11. Plans and cross-sections showing trails, sidewalks, road lighting, roadside trees, curbs, water mains, sanitary sewers and storm drains, the character, width and depth of pavements and sub-base, and the location of any underground cables. 12. Approximate location and size of any proposed electric, telephone and cable utilities, waterlines, hydrants and sewer lines, showing connection to existing lines. 13. Drainage plan, including profiles of culverts and ditches and drainage easements on the entire subdivision. Off-site drainage impacts to adjoining properties shall be assessed and identified. 14. Preliminary designs for any bridges or culverts. 15. Proposed grading, limits of vegetation clearing and landscaping plans. 16. Actual field survey of the boundary lines of the tract, giving complete description by bearings or azimuth and distance, made and certified by a NYS licensed surveyor. The corners of the tract shall also be permanently marked by monuments Planning Board and proposed roads, improvements and lot lines shall be marked only by temporary markers, shown on the plat. 17. Copy of all existing and proposed covenants or deed restrictions and draft homeowners association or similar legal documents for ownership and maintenance of common roads, driveways or common facilities intended to cover all or part of the tract. 18. Delineation of existing and proposed protected resource and recreation areas and all parcels of land proposed to be dedicated to public use and the conditions of such use. 19. Where the preliminary plat submitted covers only a part of the applicant's entire holding, a sketch of the prospective future road and drainage system of the unsubdivided part shall be submitted for study to the Planning Board. 21. Full Environmental Assessment Form (EAF) or draft Environmental Impact Statement (EIS), if required. 22. Copies of written notices and determinations received to date from other involved agencies (APA, DOH, DEC, DOT etc). 23. Additional information as deemed necessary by the Planning Board. 1. One copy of the plat to be submitted to the County Clerk and one copy for town records, prepared by a NYS land surveyor, and if required by the Planning Board to included plans prepared by a NYS professional engineer, that meet submission requirements for filing with the County Clerk, drawn with ink on suitable material, plus three copies supplied to the town. The map scale shall be one inch = one hundred feet (1 inch = 100 feet) unless specified otherwise by the Planning Board. 2. Proposed subdivision name and the name of the Town and County in which the subdivision is located; the name and address of record owner and applicant; name, address, license number and seal of the NYS surveyor and/or engineer, architect or landscape architect. 3. Road lines, protected resource and recreation areas, trails and pedestrian walkways, lots, easements and areas to be dedicated to public use. 4. Sufficient data acceptable to the Planning Board to determine readily the location, bearing and length of every road line, lot line, and boundary line; such data shall be sufficient to allow for the reproduction of such lines on the ground. 5. The length and bearing or azimuth of all straight lines; radii and length of curves; tangent bearings for each road. All dimensions of the lines of each lot shall also be given. The plat shall show the boundaries of the property, locations, graphic scale and north arrow (with orientation as to magnetic or true). 6. All offers of cession and covenants governing the maintenance of unceded open space shall bear the certificate of approval of the Town Attorney as to their legal sufficiency. 7. Permanent reference markers shall be shown and constructed in accordance with Planning Board specifications. 8. Written determinations and responses from all involved agencies including approval of the State Health Department, Department of Environmental Conservation, and/or APA of water supply systems and sewage disposal systems proposed or installed. 9. A Full Environmental Assessment Form (EAF) or draft Environmental Impact Statement (EIS), if required. 10. Construction drawings including plans, profiles, and typical cross sections, as required, showing the proposed location, size and type of road, trails or sidewalks, road lighting standards, roadside trees, limits of grading and vegetation clearing, curbs, water mains, sanitary sewer or septic systems, storm drains or ditches, pavements, and sub-base and other facilities. 11. Evidence of legal ownership of property. 12. Deed restrictions, existing and proposed in form for recording and copy of draft homeowners association or similar legal documents for ownership and maintenance of common facilities. 13. As chosen by the applicant, any required financial guarantees for public improvements (see Article 6) supported by current, professional, detailed estimates, and schedule for construction of all improvements. 14. Any other data such as certificates, affidavits, endorsements or other agreements as may be required by the Planning Board in enforcement of this law. The Planning Board, at its discretion, may waive any of the submission requirements specified in this article which it deems unnecessary for their review of the subdivision and which imposes unnecessary cost and expense upon the applicant. A major requirement of final plat approval is adequate provisions for the complete construction of infrastructure for the subdivision (see section 455). The purposes of the financial guarantee are: 1- protect the town taxpayers from liability to provide town services (road, fire and rescue services etc) IF the applicant or developer fails to satisfactorily complete the improvements as proposed and approved, and 2- help ensure the lot purchasers are provided improvements proposed by the applicant or developer. A. The construction or installation of any improvement or facilities for which a financial guarantee is required pursuant to this Article, shall be completed within the time specified by the Planning Board, not to exceed three (3) years from the date of the posting of the guarantee. B. The applicant may request an extension of time to perform required improvements provided he/she can show reasonable cause for inability to construct and install said improvements within the required time. Such extension of time shall not exceed the next construction year. At the end of such extension of time, if the required improvements are not completed satisfactorily the Town may use as much of the financial security required by this Article to construct, install, maintain, and complete the improvements as necessary to meet all applicable state and local laws, ordinances, rules, and regulations. C.	At least five (5) days prior to commencing construction of required improvements, the applicant shall pay to the Town Clerk the independent inspection and certification fee. The independent inspection and certification fee shall be used by the town to employ appropriate professional(s) to inspect and to certify all the work performed by the applicant's contractor(s) constructing the infrastructure. The fee shall be based on an updated cost estimate. The applicant shall notify the Planning Board official designated by the Planning Board in writing of the time when the construction of such improvements will be commenced so that the Board may cause inspections to be made. The inspections are to assure that all applicable specifications and requirements shall be met in the construction of such improvements, and to assure the satisfactory completion of improvements. A. Applicants for subdivision plat approvals shall provide the Town with acceptable financial security in an amount sufficient to guarantee re-vegetation and land restoration, and the installation of improvements, plus reasonable contingency for cost overruns and independent inspection and certification, all based on an up to date estimate for the projected construction schedule. Such improvements may include community water systems, community sewer systems, storm water management facilities, sewers, roads, pavement markings, traffic signs and signals, sidewalks, foot trails and others. 1. The applicant shall furnish a bond executed by a surety company in an amount equal to the cost of construction of the improvements plus contingency/inspections required by the Planning Board pursuant to this law. Any such bond shall comply with the requirements of Section 277 of the Town Law and shall be satisfactory to the Planning Board as to form, sufficiency, manner of execution and surety. 2. The applicant shall present to the Town Clerk a certified check in an amount equal to the cost of construction of the improvements plus contingency/inspections required by the Planning Board pursuant to this Law, with such funds to be held in an escrow account for such purposes only. 3. The applicant shall present to the Town Clerk an irrevocable letter of credit drawn in favor of the Town in an amount equal to the cost of construction of the improvements plus contingency/inspections required by the Planning Board pursuant to this law. For each of the above options, the required improvements shall be shown on subdivision plats, and the total amount of the required financial security shall be based thereon. Such estimates shall be certified by a licensed professional engineer, and shall be reviewed by the Planning Board for financial adequacy as a guarantee of construction and of reasonable performance during the permit timeframe and. The Planning Board and the Town Attorney shall jointly review the guarantee agreement for sufficiency of form and execution and for the soundness of the financial guarantee offered by the applicant. When a guarantee agreement has been approved by the Planning Board and the required surety bond, certified check, or irrevocable letter of credit has been received by the Town Clerk, the Town and the applicant may enter into a written agreement in order to facilitate the partial release of the financial guarantee to the applicant as work is satisfactorily completed and inspected. The agreement shall include itemizing the required improvements, establishing a schedule for the construction and installation, and inspection and certification for compliance with town approvals, for each improvement. Whenever feasible, costs shall be organized by logical phases of work completion. A. At such times as the applicant wishes to have guarantee funds released in consideration of work satisfactorily performed, the applicant shall cause to be prepared an accurate statement of the work performed and an independent, professional inspection as of a date certain. This statement shall use the same item structure as was employed in the written agreement itemizing the required improvements. B. The applicant, after preparing such statement, shall submit it for review by the independent inspecting Engineer, and for review, approval, and signature by the Planning Board and the Town fiscal officer. If the statement is approved by the Planning Board and the Town fiscal officer, the statement shall be forwarded promptly to the Town Clerk, together with a recommendation that the amount approved on said statement be released from the financial guarantee provided by the applicant. Where the financial guarantee provided by the applicant makes phased release possible, the Town Clerk will then direct in writing to the surety company or financial institution having custody of the guarantee funds to release the approved amount of those funds to the applicant. When the Planning Board approved independent inspecting engineer [Town Highway Superintendent in consultation with a licensed engineer for road improvements only], following final inspection of the project, certifies to the Town Board that all required public improvements have been completed in accordance with all applicable requirements, the Town Board may act by resolution to accept some or all of the improvements. In the event that any required improvements have not been installed as provided in the financial security and construction schedule agreement, the Town Board may declare said agreement to be in default and collect the sum remaining payable there under and the Town shall install such improvements as are covered by said agreement, or the town shall rescind final plat approvals and release remaining financial security after stabilization of the project. A. It shall be unlawful for any person to undertake a major subdivision of land through sale, lease, development or separate occupancy or to offer lots, parcels or sites for sale, lease, development or separate occupancy without first obtaining the approval of the Planning Board in accordance with the provisions of this law, and timely filing the approved and signed final subdivision plat with the Franklin County Clerk. B. It shall be unlawful for any person to undertake grading, road construction, installation of utilities or other improvements, land-clearing or disturbance, or any other land use and development preparatory or incidental to a subdivision of land except in accordance with this law. C.	It shall be unlawful for any person to fail to comply with a written directive, including a stop order and a stop-work order of the Planning Board, Code Enforcement Officer, Town Engineer, or any agent of the foregoing. D.	Where a violation has occurred or exists, the responsible persons shall include the owner of the real property which has been illegally subdivided or developed; and any contract vendee, lessee or grantee of such owner who knowingly participates in such violation; any agent who has executed an application to the Planning Board on behalf of such owner or contract vendee with respect to such real property and who knowingly participates in such violation; the owner of any lot within the subdivision who undertakes development; and any contractor, subcontractor, builder, construction superintendent, engineer, or other person who knowingly participates in managing, directing, assisting in, or who is otherwise responsible for, the illegal construction or development activities. A. Whenever the Planning Board, any agent thereof or code enforcement officer has reasonable grounds to believe that unlawful subdivision of land has been undertaken or is continuing, it will notify the applicant/owner of record of the land and direct that the unlawful activity immediately cease. No such notice is required to be acknowledged as a prerequisite to a proceeding for criminal sanctions, civil penalties or injunctive relief. B. The Planning Board may affect appropriate corrective, remediation and abatement measures, including rescission of purchase contracts and lot sales, by means of an enforceable negotiated settlement agreement with the applicant and other responsible persons. C.	When the Planning Board or any agent thereof has reasonable grounds to believe that work on any improvement in a subdivision is occurring in violation of this ordinance or not in conformance with the application or approval issued hereunder or in an unsafe or dangerous manner, it shall promptly notify the applicant and responsible person(s) and direct in writing that such work be suspended. Such order shall describe the conditions under which the work may be resumed and may be served by personal delivery or posting in a conspicuous portion of the improvement site and also mailing a copy to the applicant by certified mail. Such person(s) shall immediately cease and suspend the work until the stop-order has been rescinded. D.	If in the opinion of the Planning Board or any agent thereof a violation exists which requires immediate action to avoid a direct hazard or imminent danger to the health, safety, or general welfare of the public, it may direct that such violation be immediately remedied or may take direct action on his own initiative to abate the hazard or danger. Any costs incurred by such action shall be paid for by the applicant. If a person other than the applicant is responsible for the violation, such person shall be jointly and severally liable, together with the applicant for any such costs. E.	No certificate of compliance or certificate of occupancy for any building within a subdivision may be issued prior to satisfactory completion of the improvements required in the Planning Board's approval of the subdivision plat or any section thereof unless a performance and maintenance guarantees have been posted pursuant to this code to assure completion of the improvements before occupancy and use of structures. A violation of this local law is hereby declared to be an offense, punishable by a fine not exceeding three hundred fifty dollars ($350) or imprisonment for a period not to exceed six months, or both for conviction of a first offense; for conviction of a second offense both of which were committed within a period of five years, punishable by a fine not less than three hundred fifty dollars ($350) nor more than seven hundred dollars ($700) or imprisonment for a period not to exceed six months, or both; and, upon conviction for a third or subsequent offense all of which were committed within a period of five years, punishable by a fine not less than seven hundred dollars ($700) nor more than one thousand dollars ($1000) or imprisonment for a period not to exceed six months, or both. However, for the purpose of conferring jurisdiction upon courts and judicial officers generally, violations of this local law shall be deemed misdemeanors and for such purpose only all provisions of law relating to misdemeanors shall apply to such violations. Each week's continued violation shall constitute a separate additional violation. The severity of adverse impact to resources and the community, and the degree and frequency of disregard for provisions of this law, shall be considered in determining appropriate penalty. A. In the case of any violation or threatened violation of this law, the Town may institute any appropriate action or proceeding against the landowner and/or other responsible person(s) to prevent such unlawful action, to restrain, correct or abate such violation, and to compel compliance with the provisions of this law and any permit, approval or variance issued pursuant to its provisions. The relief specified herein may be sought in addition to an action or proceeding for criminal sanctions or civil penalties. B. The Planning Board may affect appropriate corrective, remediation, and abatement measures, including rescission of purchase contracts and lot sales, by means of an enforceable negotiated civil settlement agreement or consent order with the applicant, landowners and other responsible persons. Such agreements or orders may require the applicant and other responsible persons to pay a monetary penalty which (i) includes exemplary or punitive damages and (ii) reimburses the actual costs incurred by the Town in connection with its enforcement action such as attorneys' fees, disbursements, and costs of emergency and other corrective and restoration measures. If the monetary payments are not made, they may constitute the basis of a lien charge attachable to the land as a special assessment or charge assessable and collectable on the tax bill associated with the subject land. The Town Clerk is hereby directed to forthwith file a certified copy of this local law with the Clerk of Franklin County and Secretary of State. If any clause, paragraph, section, or part of this local law shall be adjudged by any court of competent jurisdiction to be invalid, such judgment shall not affect, impair or invalidate any other clause, sentence, paragraph, section, or part of this local law. Secretary of State pursuant to the Municipal Home Rule Law provisions. Such amendment shall apply to any preliminary subdivision plat which has not received approval, or approval with modification, prior to such date of filing and to any preliminary subdivision plat, approved with or without modification, for which a formal application for final plat approval is not received within six months of the date of such approval. This local law shall effect immediately upon filing with the Secretary of State. The following is a summary of the 3 step application and review process for major subdivisions. The time periods are established by NYS Town Law Section 276 and State Environmental Quality Review Act (SEQR) Article 8 of NY Environmental Conservation Law, but may be extended by mutual consent of the applicant and the Planning Board. References in parenthesis are to sections in the major subdivision control law. Applicant submits any additional information/sketch revisions and provides list of current adjacent property owners and their addresses. On-site review per procedures. Board may request additional meeting(s) with the applicant and concerned parties to resolve major issues of approval under the standards and guidelines (Sections 300-370) of the town subdivision law.